Ottawa, Ontario – Just a week ago today (Friday, April 5th) the Ottawa Jr. Senators defeated the Brockville Braves 3-2 for the series sweep, and for a spot in the Bogart Cup Final. The Jr. Senators will take on the Carleton Place Canadians on Sunday afternoon inside the Carleton Place Arena. They two rivals now meet in the Bogart Cup for the fourth straight season. In Ottawa’s 3-2 win last week, Declan Hilton scored twice, including the winner – which he said was the greatest moment of his career after the game. Francis Boisvert was also huge in the win, making 26-saves. Owen Cole scored two-goals and four-assists in the previous series. He is someone who the fans will need to watchout for against Carleton Place. Another player who has been hot is Francis Boisvert, who posted an 8-1 post-season record with a 1.38 GAA / .945 SV% slash-line. Following game one on Sunday, OJS will host CP on Monday night inside the Jim Durrell Sports Complex. 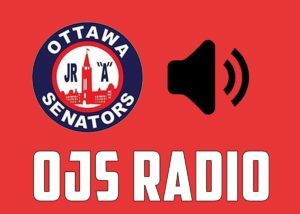 You can catch the broadcast on CKDJ 107.9 – FM / mixlr.com/ojsradio or Hockey TV.